Crabgrass is a light green, weedy grass that can appear in summer. Crabgrass and other annual grassy weeds are common problems in home lawns that can be treated through chemical and nonchemical methods. Proper lawn care practices to encourage a dense stand of vigorous grass are the best way to prevent weeds from invading. For example, mowing height can have a big impact. Lawns mowed higher (over 2½ inches) tend to have less problems with annual grasses such as crabgrass. Close-mowed lawns tend to open up, allowing weeds like crabgrass to invade. Light, frequent watering also favors crabgrass. Crabgrass often invades areas seeded in late spring because of bare soil, frequent watering, and the onset of hot weather - all ideal for its growth. Herbicides (weed killers) are also available to manage annual weeds. 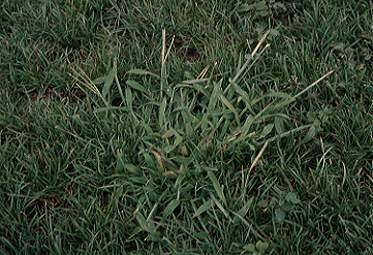 Preemergence herbicides prevent annual grassy weeds such as crabgrass from emerging. The timing of applying herbicides is important, as the control product should be applied before the crabgrass emerges from the soil. Crabgrass will germinate when soil temperatures are greater than 55 to 60F° for 7-10 consecutive days, and continues until soils reach 95F°. Other annual grasses germinate as soils get warmer than 60 degrees. For northern Illinois, late April to early May is the suggested time for applying a preemergence crabgrass herbicide. Central Illinois should consider mid to late April and Southern Illinois early to mid Apil. If the spring is cold, delay applications to the end of the recommended window of application. Many preemergence crabgrass herbicides are available in combination with lawn fertilizer at garden supply stores, so the crabgrass prevention and spring fertilization can be done at the same time, yet an early spring fertilization may not be warranted based on your lawn maintenance program. In those instances, separate applications would be better. Preemergence herbicides are available from many manufacturers using a number of different active ingredients to manage crabgrass and other annual weed grasses. The Illinois Commercial Landscape and Turfgrass Pest Management Handbook and Illinois Homeowners Guide to Pest Management (order through local Extension office) or online at Pubs Plus offer the latest information on various weeds and herbicides to control them. Some herbicides may be reapplied for extended control; refer to the label for timing and rates. Core aerifying or dethatching should be done based on label instructions. One of the management problems associated with preemergence herbicides is seeding or overseeding practices. With the exception of active ingredient siduron, preemergence annual grass weed killers will also damage germinating desirable grass seed. Often times siduron is combined with starter fertilizer. If crabgrass plants are appearing in lawns in mid to late summer, remember that they are annual plants and die as temperatures drop in fall. Postemergence crabgrass herbicides need to be applied when crabgrass plants are very small; typically crabgrass is noticed too late for these to be effective. The suggested strategy to avoid crabgrass next season would be to improve the lawn through cultural practices and consider a preemergence herbicide in spring. Until the conditions that promote crabgrass are corrected, crabgrass and other weeds in the lawn will continue to be a concern. Using cultural practices such as core aeration to reduce compaction, topdressing with organic matter, overseeding to increase grass plant density, managing irrigation, managing thatch and mowing at the proper height will lessen the chances of crabgrass as a weed problem in the lawn.